If you believe that achieving your full potential requires you to have access to the best gyms with cutting-edge equipment and the best supplements available, stop whatever you’re doing right now and get ready for an inspiring dose of reality that will destroy all of your favorite excuses for not putting maximum effort into your training. 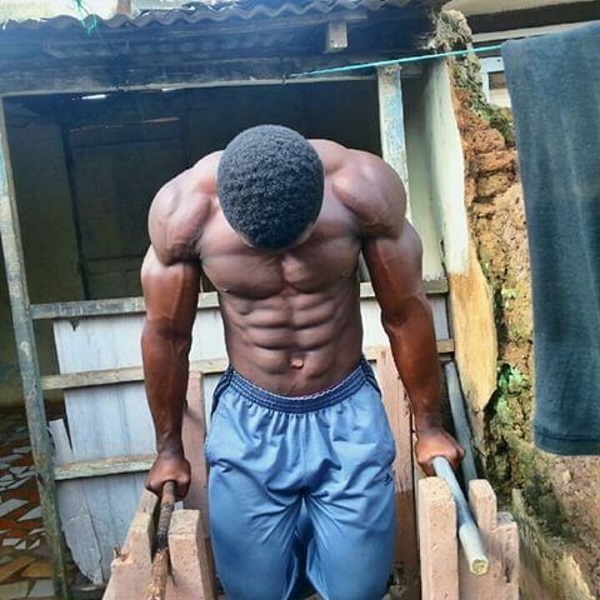 While all of us whine about our crowded gyms while gulping down enriched protein shakes, Kulbila Samuel, a 24-year-old natural bodybuilder from Ghana, one of the poorest West African countries, is busy building a pro level physique without any access to trendy equipment or a real gym, for that matter. 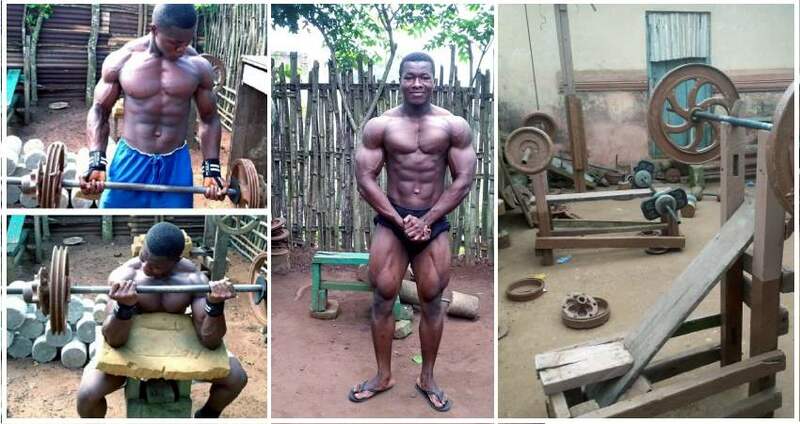 This passionate guy and his crew built their own gym with homemade dumbbells, barbells and benches – the dumbbell’s weight is made out of cement, barbells are made of old iron rods and the squat racks are made from wood. Thanks to the internet, Kulbila has learned all he needed to get massively ripped from watching YouTube tutorials and reading forum discussions, and then applied it the best way he could. The results speak for themselves. In Ghana supplements are scarce and expensive, and although Kulbila has tried using creatine for a short period in his past, he relies most heavily on his diet, consisting only of home-cooked food, for optimal nutrition. And his approach has definitely worked out – at 5 feet and 8 inches, Kulbila weighs 200 pounds and has only 10% body fat. The dedicated bodybuilder says he doesn’t always have a specific workout plan but he makes sure to train all body parts within the week, taking the weekends off to rest. His typical workouts include plenty of dips and bench presses with increasing weight. Besides having a well-developed musculature, Kulbila has a very strong mindset that helps him progress toward his goals with relative ease. His basic ‘no excuses’ philosophy about weightlifting can be best understood from the caption of one of his instagram photos: “Being strong isn’t about having big muscles or having a mouth that talks a big game. You can’t see real strength, because it isn’t something that can be measured by just looking at someone. Strength is measured by your ability to stand against the voices of doubt. It is calculated by how you get the job done despite being told that you can’t succeed. We couldn’t agree more. Make sure to show this great guy some love on his Instagram profile kulbila_fitness, and then go pump some iron!